The aim of the retreat is to assist men with integrating family life, professional work, leisure time and social dealings more fully with their relationship to God. Each day will begin with morning Mass and include a series of meditations, talks, and spiritual reading, Holy Rosary and other Catholic piety practices. The specific agenda for the weekend will be provided on arrival and allows for time of private prayer and reflection. There will be opportunities for confession and spiritual direction. A private common room in the Conference Centre and the Rose Chapel are reserved for the exclusive use of retreat participants. 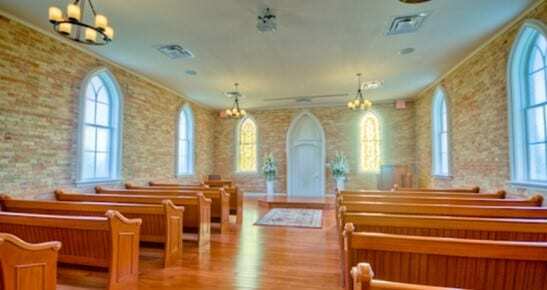 The Rose Chapel is a fully restored, century-old church with cathedral seating and wheelchair accessibility. Remainder to be paid at time of retreat. To Register, contact info@famfi.ca, Brian Simpson bsimpson@execulink.com or Pete Aarssen pete@maplecreekpartners.ca. 203 Reycraft Avenue, Glencoe, ON N0L 1M0.